Handy tool from Delphi Metals created to easily get your ring size. 1. Put your ring on the centered circle in the first screen. 2. You can adjust the circle's size by using the bar placed at bottom to match up with the circle's size with the ring's inner circle. 3. And then popup will be arisen as per that adjusted ring size and you can have the your ring size in US standard. You can start measuring from the yellow line at the top place. 1. Please take one paper and cut a thin strip. 2. You can wrap that strip around your finger. Take care of one important point that the strip is below the joint of your finger and close to your knuckle. You can mark down the spot where the paper meets. 3. 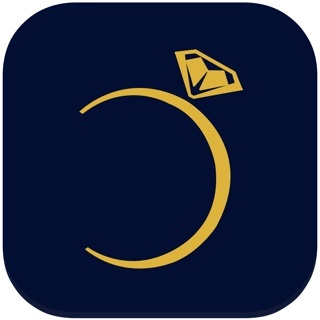 Then use app's chart to measure your ring size. For that needs to start by placing one end of strip at the very top of screen. 4. The pop up would come out with the measured size. You can have that size in US standard.